ARLINGTON, VA; September 21, 2015 – PBS today announced additional details for its special broadcast, AMERICA AFTER CHARLESTON, a one-hour town hall meeting that explores the many issues propelled into public discourse after a white gunman shot and killed nine African-American parishioners in Charleston’s Emanuel African Methodist Episcopal Church in June 2015. Gwen Ifill, PBS NEWSHOUR co-anchor and managing editor, and moderator and managing editor of WASHINGTON WEEK, moderates the program, which was taped on September 19 at the Circular Congregational Church, just blocks from the site of the shootings, before a live audience of more than 250 community members. 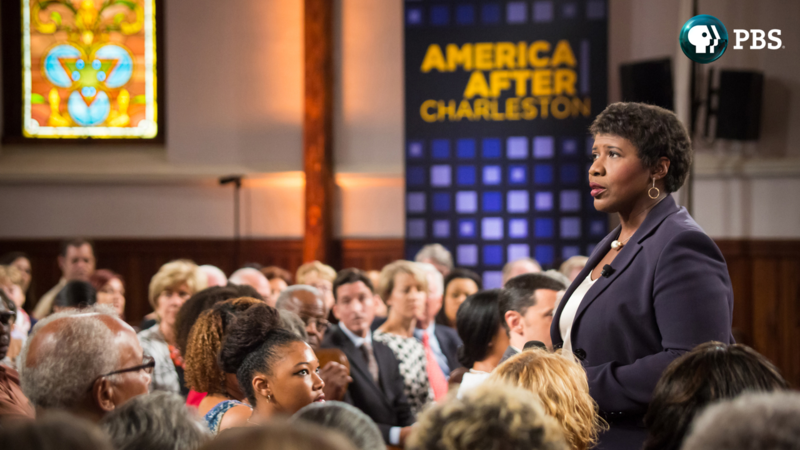 AMERICA AFTER CHARLESTON, produced for PBS by WETA Washington, DC, WGBH Boston and South Carolina ETV Network, with funds provided by PBS and the Corporation for Public Broadcasting, premieres Monday, September 21, 2015, 9:00-10:00 p.m. ET on PBS (check local listings). Polly Sheppard, one of the only two adult survivors of the Emanuel AME shooting, spoke at the town hall. Through conversations with the families of the victims, Charleston civic leaders and commentators from across the country, this special brings together a diverse range of voices to engage in constructive conversation about the issues of race, structural inequality and politics raised by the events in South Carolina. Panelists include Rev. Dr. Norvel Goff, Interim Pastor, Emanuel AME Church in Charleston; Cornell Brooks,President and CEO, National Association for the Advancement of Colored People (NAACP); Rep. Jenny Horne, R-Summerville, South Carolina House of Representatives; Alexia Fernandez Campbell, Staff Correspondent, National Journal; and Arielle Newton, Black Lives Matter NYC & Founder and Editor-in-Chief, Black Millennial. AMERICA AFTER CHARLESTON also features results from a poll conducted by PBS NEWSHOUR and Marist College’s Institute for Public Opinion, illustrating the contrast in opinions along racial lines regarding opportunities available today for African Americans; highlights data provided to PBS exclusively by Facebook, demonstrating trends in social media reactions surrounding such shootings; and includes a pre-taped segment about social inequities by Hari Sreenivasan, Senior Correspondent for PBS NEWSHOUR and Anchor of PBS NEWSHOUR WEEKEND. AMERICA AFTER CHARLESTON is a multi-platform initiative with diverse digital and social media integration. Perspectives shared on social media before the taping were incorporated into the town hall conversation, and during the September 21 broadcast, viewers will turn to social media to become part of the conversation unfolding onscreen. The discussion will revolve around the hashtag #AfterCharlestonPBS, and select tweets and Facebook comments will be featured live on air. WGBH will be leading the national conversation from its studio in Boston, convening both local and national productions such as Frontline, Basic Black, World Channel, and PRI’s The World. Participants will live tweet the show, adding context and mining for new perspectives on social media. Join the live conversation by using the hashtag #AfterCharlestonPBS on Facebook and Twitter throughout the hour. The AMERICA AFTER CHARLESTON website, pbs.org/aftercharleston, will include exclusive videos, visualizations and infographics, and put the social media conversation front and center, aggregating the best comments, perspectives and additional pieces of context around the issues of race, identity and politics. WETA Washington, DC, is one of the largest-producing stations of new content for public television and serves Virginia, Maryland and the District of Columbia with educational initiatives and with high-quality programming on four digital television channels. Other WETA productions and co-productions include PBS NEWSHOUR, WASHINGTON WEEK WITH GWEN IFILL, THE KENNEDY CENTER MARK TWAIN PRIZE and documentaries by filmmaker Ken Burns, including THE ROOSEVELTS: AN INTIMATE HISTORY and a forthcoming film on Jackie Robinson. Sharon Percy Rockefeller is president and CEO of WETA. More information on WETA and its programs and services is available at www.weta.org. Video and audio excerpts from AMERICA AFTER CHARLESTON are available upon request.